Do the Lutheran Symbolical Books Speak Where the Sacred Scriptures Are Silent? Arthur Carl Piepkorn (1907-1973) taught systematic theology at Concordia Seminary from 1951 to 1973. This article was published in Concordia Theological Monthly, January 1972 (vol. 43, no. 1), pp. 29–35, and reprinted in Concordia Journal, July 1989 (vol. 15, no. 3), pp. 351–359. Yet another set of important questions concerns the use of the Scriptures in theology. It is easy to say, “The Bible teaches…” or “The Bible proves…” But it is not always easy to explain how it teaches this or proves that. This is the case, as Arthur Carl Piepkorn observed, even in the case of the Lutheran Confessions. His 1972 article, “Do the Lutheran Symbolical Books Speak Where the Sacred Scriptures Are Silent?” (which appears at ConcordiaTheology.org), asks about how the Symbols interpret and use the Scriptures. He noted ways in which the Confessions may appear to lack the support of the Scriptures they rely on, such as the use of non-biblical categories (e.g., “substance”) and debatable citations (e.g., use of Mark 16:16 in the Catechisms). These confessional questions will continue as long as questions about the biblical basis for Lutheran doctrine remain, but, more than this, these kinds of theological issues will continue as long we use the Scriptures. Piepkorn’s article is published here to extend into cyberspace the Journal’s significant conversation about how we theologize with and about the Bible. Piepkorn’s conversation partners in the print edition are Hermann Sasse, Martin Franzmann, and Jack Preus II. To order the Spring 2010 issue or to start a subscription to Concordia Journal, contact us at ConcorJournal@csl.edu or 314-505-7117. The Lutheran Symbolical Books do not intend to speak except where the Sacred Scriptures speak. The authors of the Symbols did not in their time feel that they were speaking where the Sacred Scriptures were silent. But in the 20th century the Symbolical Books sometimes appear to be speaking at points where they cannot fully and fairly cite the Sacred Scriptures in support of their statements. Sometimes the Symbols speak in nonbiblical categories. This is partly the recurring problem of translation, present in the Sacred Scriptures themselves with the transition from Hebrew to Aramaic and from the Semitic languages to Koine Greek. It has occurred every time that a part of Christianity has attempted to affirm its message in a new culture; indeed it has happened to a degree every time that Christianity has had to express itself in a new language. Sometimes it happens even within a language when the meanings of words change either obviously or subtly. Although the Symbolical Books make liberal use of the Sacred Scriptures, they are not Sacred Scripture themselves. They are, if one were to look for the most inclusive category, formulated theology—sometimes academic theology, sometimes popular theology. Where they are compelled to stake out new theological territory, there may be a certain amount of serious synthesis of Biblical materials. But by and large, the use of Sacred Scripture by the Symbols is largely illustrative and probative. They operate with selected Biblical materials. Some of these the Symbolical Books cite, quote, or allude to. Others are in the back of their authors’ minds. Centuries of theological and liturgical tradition have hallowed the meanings that they give to certain Biblical texts. With these Biblical materials they combine the historical experience and expressions of the church, sometimes recent, sometimes more remote. With these Biblical materials they also combine materials expressed in the categories common within the universe of discourse out of which the particular document arises. It is these nonbiblical elements that create the problem for us. If a category with which a theologian operates is not a Biblical category, he immediately has difficulty in documenting his assertion Biblically as fully as he should be able to do. To take one example, there is no Biblical term in the Old or New Testament that exactly expresses the idea of “substance” as this idea developed within the classic tradition. In Formula of Concord, 1, the argument involves the question if the sinfulness with which a human being comes into the world is a “substance” or an “accident.” This was one of the crucial issues in the controversy about the heresies of Matthias Vlačić, or Flacius (1520–1575). His opponents were driven to elaborate lengths in order to show that Vlačić was wrong Biblically. The very fact that Vlačić died unpersuaded may illustrate the difficulty of demonstration. The same problem emerges with consubstantialem patri (“consubstantial with the Father”) in the creed of the 150 Fathers, our “Nicene” Creed, where the theologians made an effort in the original Greek of Nicaea I and Constantinople I to rehabilitate a word that had become tainted with heresy, that is, homoousios (“one in being”). They really succeeded only after the church had differentiated two synonyms, ousia (“being”) and hypostasis (“substance”), the latter the etymological counterpart of the Latin substantia. The same problem occurs twice in the Symbol Whoever Will Be Saved, our “Athanasian” Creed, where substantia on the one hand describes the being of the Triune Godhead as such (4), and on the other hand the peculiarity of the Father, who sires Christ before the ages, and the peculiarity of the Blessed Virgin Mary, who gives birth to Him in the present age (29). The problem emerges again in the discussion of the Eucharist, when the Symbols declare that the body of Christ is substantially (substantialiter) present (Apology, 10, 1, for instance). We have analogous difficulties with other nonbiblical technical terms. Persona, reproducing either the Greek prosôpon (“face, mask”) or (after Constantinople I) hypostasis, to describe the Father, the Son, and the Holy Spirit, is one of them. Significantly Augsburg Confession, 1, 4, takes considerable pains to define persona/Person in neuter terms (das selbs bestehet, quod proprie subsistit) rather than in masculine or feminine terms. Linked with persona as problems are the theological term trinitas in the discussion of the Godhead and the term natura (which does not correspond precisely to physis anywhere in the New Testament, including James 3:10 and 2 Peter 1:4) in the discussion of the incarnation. Even nontechnical terms create problems. The Symbolical Books declare in connection with their observation on the Sacrament of the Altar that in the sacrament the bread and wine are the body and the blood of Christ (for example, Smalcald Articles, Part Three, 6, 1) or the communion of His body and blood. These they see as “the formulas of Christ and of Saint Paul” (Formula of Concord, Solid Declaration, 7, 35). But in order to preserve the patristic principle that there is in the Sacrament of the Altar both a heavenly component (materia coelestis) and an earthly component (materia terrena), they come up with a number of other formulas. The body and blood of Christ are under the bread and wine, they say (Small Catechism, Sacrament of the Altar, 2), or under the form of bread and wine (Augsburg Confession, 10, 1 German), or with the bread and wine (Apology, 10, 1). Especially after Trent they invoke the “in-with-and-under” formula (Formula of Concord, Solid Declaration, 7, 35). But we have no explicit Biblical basis for any of these prepositional formulas. Another term that the Symbolical Books use frequently, but which has no Biblical counterpart for its theological meaning, is “sacrament.” As a result there can be no Biblical basis for arguing about either the number or the definition of the sacraments, nor may one invoke Biblical authority for using the category of sacrament as a genus within which one can compare the individual sacraments as species, whether one counts two or many. A related difficulty is the one that crops up when the Symbolical Books take their metaphors from nonbiblical sources. One example would be the analogy in the Symbol Whoever Will Be Saved that as the reasoning soul and flesh are one human being, so God and a human being are one Christ (35). Another is the patristic symbol of the glowing iron, seen as some kind of amalgam of fire and metal, to illustrate the hypostatic union of the Godhead with the humanity of our Lord (Formula of Concord, Solid Declaration, 8, 18, for instance). This roster of cases where the vocabulary of the Symbolical Books goes beyond the Biblical categories is merely illustrative and not exhaustive. The solution is obviously not to retreat into a biblicism that makes the theological enterprise irrelevant, nor is it to jettison the Symbolical Books or to characterize them as outmoded and useless. Every person who stands committed to the Symbolical Books has an obligation to try to interpret their meaning and their intention as accurately as possible to his hearers. Derision is obviously precluded. On the contrary, he needs to help his hearers see that the authors of the Symbolical Books were attempting to express the teaching of the Sacred Scriptures even when in the circumstances they had to use a vocabulary and categories that were not exactly coextensive with the Biblical vocabulary and Biblical categories. But we must be careful not to absolutize these later formulations. Interpreting the Symbolical Books to the twentieth century involves entering into the problems of symbolical hermeneutics more intensively than most Lutheran clergymen did when they were seminarians. It calls for really knowing what the Symbolical Books mean. It is not enough to make a stab at their meaning, or to assume that the words mean what their English cognates have come to mean. The interpreter of the Symbolical Books needs seriously to inform himself and on this basis to help his hearers to an appreciation of the concern of the authors of the Symbolical Books to restate the doctrinal content of the Sacred Scriptures. A second situation where the Lutheran Symbolical Books seem to speak where the Sacred Scriptures do not develops when the Symbols go beyond the Biblical materials. The official 1584 Latin translation of the Book of Concord in the First Part of the Smalcald Articles describes the Blessed Virgin Mary as semper virgo (“ever virgin”) (III). It alleges no Biblical support. Apology, 4, 206, asserts that the pagans took their sacrificial system from the patriarchs by imitating the actions of the latter. While this opinion was common in the 16th century and before, it is no longer tenable as a matter of religious-historical fact. Similarly the same section (4, 209) asserts that the custom of human sacrifice among the later Israelites resulted from the people having heard and having misunderstood the Genesis account of Abraham’s interrupted sacrifice of Isaac. Again, Formula of Concord, Solid Declaration, 8, 25, describes the wisdom and understanding that the 12-year-old Child Jesus displayed in the temple as miraculous and ascribes it to the hypostatic union. This conclusion, while not wrong, nevertheless is not a Biblically necessary one. A third situation where the Symbolical Books appear to try to speak where the Sacred Scriptures do not speak is related to the second. It involves cases in which the Symbolical Books extract doctrine from data that their authors could regard as solid enough, but that we now should be inclined to regard as isagogically, hermeneutically, and text-critically inadequate. The first example is an obvious one because it is catechetically unavoidable. It is the citation in both of the Catechisms of Mark 16:16, part of the second-century “Longer Ending” of the second Gospel: “He who believes and is baptized will be saved, but he who does not believe will be condemned.” This is one of the most frequently alluded to verses in the Symbolical Books; it occurs at least eight different times. Significantly, the Symbolical Books are really concerned only about the first half of the verse—“he who believes and is baptized will be saved.” But the very presence of this textually dubious verse and the fact that the Symbolical Books make use of it theologically present a problem. A second example is the occasional allegorizing hermeneutical method of the Apology. In 24, 36–37, Num. 28:4–8 is examined; the Apology explains that the daily sacrifice that is to be perpetuated is not the sacrifice of the mass. The cited description of the daily burnt-offering of two lambs shows this, the Apology argues. The lamb signifies Christ’s death. The pouring of the wine signifies that throughout the world believers will be sprinkled and sanctified with the blood of the lamb by means of the Gospel. The cereal offering mixed with oil signifies the invocation and thanksgiving in which all of the faithful engage in their hearts. Another example (24, 34): In Mal. 3:3 the sons of Levi are confidently identified with the preachers of the Gospel in the New Testament. Their sacrifices are the preaching of the Gospel and the good fruits of such preaching. Again (24, 46–47), the abomination of desolation in Daniel 11 and 12 is the sad state of the late medieval church, climaxing in the horrible profanation of masses and many other godless forms of worship in the churches. Of a piece with these is the passage in the Smalcald Articles (Part Two, 4, 10) that sees the Roman pope (or papacy) as the veritable antichrist on the basis of 2 Thessalonians 2. The crucial words are those in verse 4, which describe the eschatological man of lawlessness (who is not called antichrist in this passage) as putting himself over God and against God. The key to the prophecy for Luther is the closing clause of the bull of Boniface VIII Unam sanctam (1302) which makes it necessary for salvation for everyone to be under the bishop of Rome. What has made Luther acutely aware of this relatively unimportant document out of the conflict between Boniface VIII and Philip the Fair was the revival and reassertion of the principle of Unam sanctam by Leo X at the Fifth Lateran Council of 1517. It is this insistence of the pope on subjection to him that according to Luther is really to set oneself over and against God. The question here is not whether or not the papacy ever exhibited antichristian features. Nor is the question whether or not Luther had reasons for his compulsion to identify the papacy with the western antichrist. The point here is merely that Luther is availing himself of an exegetically frail support for the identification first of the man of lawlessness and second of the antichrist with the papacy or the pope at Rome. Other examples meet us in what we can describe as specifically “Lutheran” interpretations of Biblical evidence. In the symbols we encounter this type of exegesis in Apology, 4, 188, which suggests that orthotomein (“to handle rightly, to cut in a straight line”) in 2 Tim. 2:15 has to do with the correct distinction of Law and Gospel. The Apology argues that after we have recalled pious minds to a consideration of God’s promises, the free forgiveness of sins, and the reconciliation that takes place through faith in Christ, we then add the doctrine of the Law. This it calls orthotomein. Another passage is Acts 3:21, which the Lutherans in Formula of Concord, Solid Declaration, 7, 119, wanted to read “Christ has to take over heaven” (in Latin, oportet Christum caelum accipere). When the Reformed theologians inverted the subject and object of the accusative-infinitive construction and made it read, “Christ has to be comprehended by heaven” (oportet Christum caelo capi), the Lutherans accused the Reformed of deliberate and malicious distortion of the text to support the latter party’s erroneous teaching about the Sacrament of the Altar. Even within the Lutheran community not many major exegetes have taken the “Lutheran” side of this controversy. It may be useful here to stress an important principle relating to the use of the Sacred Scriptures in the Lutheran Symbolical Books. It is that Lutherans are not bound to the specific interpretation of a particular Biblical text that we may find in the Symbolical Books. This is even a necessary principle, because sometimes two interpretations of the identical text may be incompatible with one another. A case in point is Gal. 3:24, “The Law was our paidagôgos to lead us to Christ.” In Apology, 4, 22, the Law is understood in what Luther would have called its usus politicus. The paidagôgos is the civic discipline by which God maintains a modicum of justice among human beings. In Formula of Concord, Solid Declaration, 5, 24, the paidagôgos is the Law in the technical Lutheran sense, the Law which “always accuses,” which terrifies consciences so that they flee to Christ, who is the end of the Law. What Lutherans are bound to is the doctrinal content of the Lutheran Symbolical Books, even though in a particular place a doctrinal conclusion (as long as it accords with the analogy of faith) may be based on the same kind of frail and debatable exegetical evidence that goes, alas, into every commentary and every translation at one or the other place. A parallel principle applies in the case of doctrinal conclusions based on questionable or even clearly defective textual evidence or isagogical information. It is only by frankly facing and thinking through the problems the Symbols present that Lutherans can achieve that joy in their commitment to the Lutheran Symbolical Books that will enable them to be in the best sense of the term evangelical Lutherans. Following a patristic tradition that goes back at least to St. Ambrose, Lutheran theologians as late as the Danish Orthodox dogmatician, Bishop Jasper Rasmussen Brochmand (1585–1652), sometimes adduced Ezek. 44:2. Unlike a later Lutheran catechetical tradition, the Symbolical Books are not concerned about deducing from the second half of the verse that it is the contempt of Baptism and not the lack of it that condemns—a kind of Lutheran equivalent of the Roman Catholic baptism of desire. Even in the one case where the Large Catechism comes to speak about the vice of contempt (Baptism, 31), it proves its point from the first half of the verse. The Lutheran Symbolical Books do not define the Biblical canon. They operate with “prophetic and apostolic” Scriptures rather than “canonical” Scriptures. (A reference to “canonical scriptures of God” occurs in Augsburg Confession, 28, 28 Latin [where the German has “die heilige gottliche Schrift”], but this is in a quotation from St. Augustine’s De unitate ecclesiae [“On the Unity of the Church”], 11, 28 [Migne, Patrologia Latina, 43, 410–11]. For St. Augustine, of course, the “canonical scriptures” included the so-called Old Testament Apocrypha; see his De doctrina Christiana [“On Christian Doctrine”], 2, 13 [Migne, Patrologia Latina, 34, 41]). The situation for Lutheran theologians is accordingly different from that which confronts Roman Catholic theologians. On April 8, 1546, the Council of Trent anathematized “anyone who would not receive as sacred and canonical these entire books [that is, those named in the decree defining the canon of the Bible, including the Gospel According to Saint Mark] with all of their parts, as they are customarily read in the Catholic Church and are contained in the ancient Vulgate Latin edition” (Denzinger-Schönmetzer, Enchiridion symbolorum, definitionum, et declarationum de rebus fidei et morum, No. 1504). From the second of the “Capita dubitationum super decreto librorum sacrorum et traditionum transmissa ad omnes patres per eos examinanda etc. 29. martii 1546” reproduced in Stephanus Ehses, ed., Actorum pars altera (Societas Goerresiana, eds., Concilium Tridentinum, 5 [Freiburg-im-Breis-gau: Herder, 1964], 41), it is clear that the council fathers specifically included Mark 16:9–20, in their intention. Chapter 2 of the dogmatic constitution Dei filius promulgated at Vatican I on April 24, 1870, explicitly appealed to the Tridentine decision and required that the books listed “be received as sacred and canonical in their entirety and with all their parts, as they are recalled in the decree of the same Council [of Trent] and are contained in the ancient Vulgate Latin edition” (Denzinger-Schönmetzer, No. 3006). For summary discussions of the implications of these decisions see Eugène Mangenot, “Canon des livres saints,” in A. Vacant and Eugène Mangenot, eds., Dictionnaire de théologie catholique, 2 (Paris: Letouzey et Ané, 1905), cols. 1601–5, and Alfred Durand, “Vulgate Latine et S. Jérôme,” in A. d’Alès, Dictionnaire apologétique de la foi catholique, 4th ed., 4 (Paris: Gabriel Beauchesne, 1922), cols. 1972–74. On June 26, 1912, the Roman Catholic Pontifical Biblical Commission answered in the negative the questions “if the reasons with which some critics endeavor to demonstrate that the last 12 verses of the Gospel of Mark (Mark 16:9–20) were not written by Mark himself but were appended by a different hand are such that they provide a right to declare that these verses are not to be received as inspired and canonical, or at least that they demonstrate that Mark is not the author of these same verses” (Acta Apostolicae Sedis, 4 , 463). The number of serious Roman Catholic exegetes who feel themselves bound by such decisions of the Pontifical Biblical Commission is no longer as great as it once was; see Thomas Aquinas Collins and Raymond E. Brown, “Church Pronouncements,” in Raymond E. Brown, Joseph A. Fitzmyer, and Roland E. Murphy, eds., The Jerome Biblical Commentary (Englewood Cliffs, N.J.: Prentice-Hall, 1968), p. 629, esp. section 25. A classic example outside the Symbols is the identification of Luther as the second angel of Rev. 14:6–7, which the Epistle prescribed in The Lutheran Liturgy for the Feast of the Reformation implies and perpetuates down to the present. This has been the common position in The Lutheran Church—Missouri Synod at least as far back as 1858, when it was affirmed in the essay read, presumably by Carl Ferdinand William Walther, at the fourth convention of the Western District of The Lutheran Church—Missouri Synod (Antwort auf die Frage: Warum sind die Symbolischen Bücher unserer Kirche von denen, welche Diener derselben werden wollen, unbedingt zu unterschreiben? [St. Louis: A. Wiebusch und Sohn, 1858], apparently a separate reprint from Verhandlungen der vierten Sitzungen des westlichen Distrikts der Deutschen Evang.-Luth. Synode von Missouri, Ohio und anderen Staaten im Jahre 1858 [St. Louis: A. Wiebusch und Sohn, 1858]; the essay was reprinted in Der Lutheraner, 14 , 201 to 206, and in an abbreviated English translation by Alex William C. Guebert, “Why Should Our Pastors, Teachers, and Professors Subscribe Unconditionally to the Symbolical Writings of Our Church?” in Concordia Theological Monthly, XVIII , 244–53). It is an outstandingly bold move to publish this article by Dr. Piepkorn, especially among us Missouri Synod Lutherans who fundamentally believe God’s Word is “inspired, inerrant, infallible” in the modern meaning of those words. It is also bold to plan on continuing the discussion with the lecture program this September. Courage! If Dr. Piepkorn’s methods were applied to Scripture itself, we would have to understand the Scripture in terms of the 1st century, to the best of our ability to do so. That would radically change how many of us study the Scripture. It would also change what we say about the Scripture. That would be dangerous among us, unless we steadfastly determined to know nothing, truly nothing, other than Jesus Christ and him crucified. Wow! Most of what I’ve read by AC Piepkorn has been concentrated on liturgical studies, which he seems to have mastered quite well. I wasn’t around (at least not paying attention, because I was too young) during the 1960’s and 1970’s when the Historical-Critical method enveloped my alma mater. Piepkorn died before the walkout but I know some at the time said that he was deeply involved in the spread of this incongruent method of Biblical interpretation. And while the Symbols clearly are not Scripture and because of their interpretive nature are more open to such textual criticism it seems that in this article Piepkorn is using a backdoor approach to textually analyze Scripture through the medium of the Symbols. If his analysis would stand much of the core of the Symbols would be devoid of Scriptural basis, which clearly isn’t the case. I’m not totally in disagreement with some of his analysis per the culturally specific definitions he observes, but he goes too far by suggesting that Mark 16:16 isn’t in harmony with the rest of Scripture and thereby an unusable appendage. By all means use this article as a straw-man to open your debate, but be careful for there are unfortunately still some who would salute this flag just because it was once flown by the great AC Piepkorn. Erv — Thanks for reading and offering your thoughts. I’d like to interact a little bit with what you say, because I think that you are not fair to Piepkorn’s point nor to the article in general. The essay hardly was intended as a “straw man” — in fact, it was reprinted in the Concordia Journal in a 1989 issue honoring 150th anniversary of the founding of Concordia Seminary. 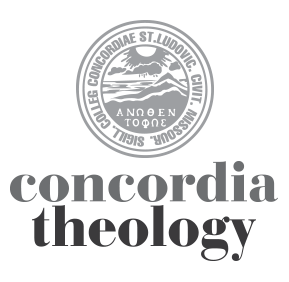 This was a “double issue” that reprinted classic and important essays from the pages of Concordia Theological Monthly and Concordia Journal. I don’t have the issue in front of me (it is in a box — yet another office move), but there were other classic essays by Walther and Pieper in that issue, as I recall. As a student I was required to read the essay as a helpful way to resolve the seeming tensions between biblical exegesis and symbolics. The faculty at the time of the 1989 issue — the same one that taught me — can hardly be described as encouraging the “historical critical method.” And, it should be obvious, neither does the current faculty. More to the point of the article, however. I did not read Piepkorn as “suggesting that Mark 16:16 isn’t in harmony with the rest of Scripture and thereby an unusable appendage.” He says no such thing, and the NT is full of clear references to the benefits of Baptism. His point is rather this: If the Confessions cite a passage that is demonstrably not written by the apostles, what do we do now? Furthermore, the rest of the discussion in Piepkorn focuses on issues regarding words that additional linguistic and historical evidence have shown to mean something other than what they Confessors assumed them to mean. This should not be surprising. Given that all exegesis involves historical data of the meanings of words in their historical contexts (what we shorthandedly have called “historical-grammatical exegesis”), additional historical evidence will always sharpen our understanding of the biblical text. Far from claiming that the Confessions “have no Scriptural basis,” Piepkorn is trying (struggling?) to maintain both Scripture as the norma normans and the Confessions as the norma normata in cases where the Confessors’ exegesis appears to be able to be sharpened, perhaps even corrected. Now, having said all that, I do wish that Piepkorn was a bit more clear on what exactly to do now. He leaves me with the feeling that he is on the right track, but I need more to resolve these problems. I do find the Franzmann essay, another reprint in the Spring 2010 Concordia Journal, more helpful on precisely this topic. At times, he notes, the Confessors seem a bit arrogant when they say that “we don’t need to cite a particular passage, we have all the Scriptures on our side.” Franzmann helps us out of the trap of proof-texting that is easily fallen into. But that is another topic. I must say: what an excellent article by Piepkorn! Makes me want to find more of his writing. He certainly gives us a lot to think about with regard to the interpretation of our symbols though I agree with Dr. Kloha. It would be nice if there was more discussion about what to do about it. The first commenter, Jim, is right on. This is a conversation that will lead to us truly knowing nothing except Christ and Him crucified. And what is theology for, after all? Looking through this website has me very excited about the upcoming Theological symposium. If the symposium continues to probe these types of questions with regard to the Scriptures, it will certainly be a fascinating conversation. A few comments for any who come across this article, as I did by accident in July of 2012. First, I published this article in The Sacred Scriptures and the Lutheran Confessions, volume 2 in The Selected Writings of Arthur Carl Piepkorn,” foreword by Robert Kolb, introduced and edited by Philip J. Secker, Mansfield, Connecticut: CEC Press, 2007, pp. 262-74. All foreign language in the text and important foreign language in the footnotes have been translated in volume 2 and many editorial notes have been added. Ordering information is on http://www.Piepkorn.org. Symbolical Books and the Sacred Scriptures. interpretation to certain Biblical terms and texts. Although liturgy and doctrine are intimately connected, as the old phrase lex orandi est lex credendi reminds us, none the articles in volume 1 and 2 of Piepkorn’s Selected Writings are about liturgical studies in the narrow sense of the term. (Volume 1, The Church, edited by Michael Plekon and William Wiecher, ALPB Books, 1993, 2006, is available from alpb.org, or from me if ordered along with volume 2). The same can be said about the vast majority of his published writings. Piepkorn’s doctorate was in Old Testament Theology from the University of Chicago Divinity School. He did his dissertation and much of his course work in the Oriental Institute, specializing in Assyriology. So he was a very well trained and very competent exegete, so much so, George Lindbeck has said, that the exegetes on the Lutheran/Roman Catholic Dialogue treated him as an equal, something they did with no one else on the Dialogue. He was largely self-trained in symbolics, especially but not limited to Lutheran symbolics. In the late 60s and early 70s he represented a middle position along with others on the faculty of Concordia Seminary between what he referred to as the “superorthodox” or “rigorists” on the right and some who were or became liberals after they left the Seminary. If you want to know his answer to “what next,” you should at least read volumes 1 and 2 of his Selected Writings. For the reasons I list on the front page of http://www.Piepkorn.org, I recommend you begin with volume 2. I will send a free copy of my 60 page plus partially annotated Piepkorn bibliography by email attachment to anyone who requests it. My email is psecker###@snet.net (remove the ### which is there to foil web crawlers). PS I am almost finished editing one of his liturgical monographs: The Architectural Requirements of the Lutheran Cultus (1963). It is also available free by email attachment. Since it is in the public domain, I will be posting it on the website too, when I can find the time.